Mühltal, Sep 23rd 2015 – CAD/CAM is the future of dental technology. Highly precise dental milling machines are able to produce perfectly fitting indications with a high wearing comfort using only a minimum of material – a technology dental technicians and patients profit from. 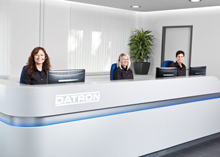 The Hildesheim-based dental laboratory “Dentallabor Eppers” shows how CAD/CAM can successfully be integrated into an existing workflow: The DATRON customer uses a D1 pure dental milling machine including accessories to produce solid ceramics indications and is convinced of the possibilities provided by the CAD/CAM solution. The laboratory’s success story and an example treatment are detailed in a “Das international Zahntechnik Magazin” article that should be read by CAD/CAM users as well as those who aspire to become one.